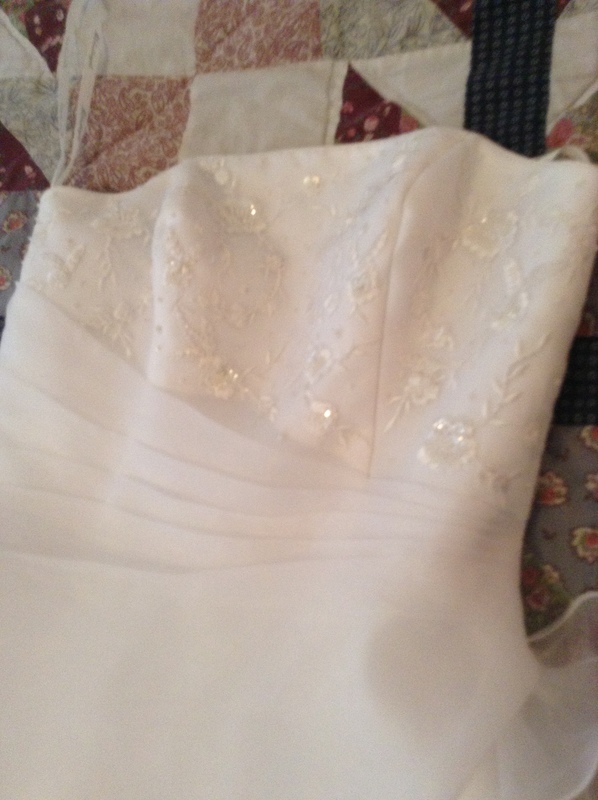 Regency ball gown from a wedding dress??!! So…I think I may be going to the Jane Austen Society of North America conference in Louisville, KY this year! I didn’t want to go to a conference (other ones I was looking at were Historical Novel Society and Romance Writers of America) without my husband and he said October would work best for him to get off work. We also don’t care too much for NYC and Louisville is not as far as Denver for travel expenses and in case we need to hurry home for the kids. 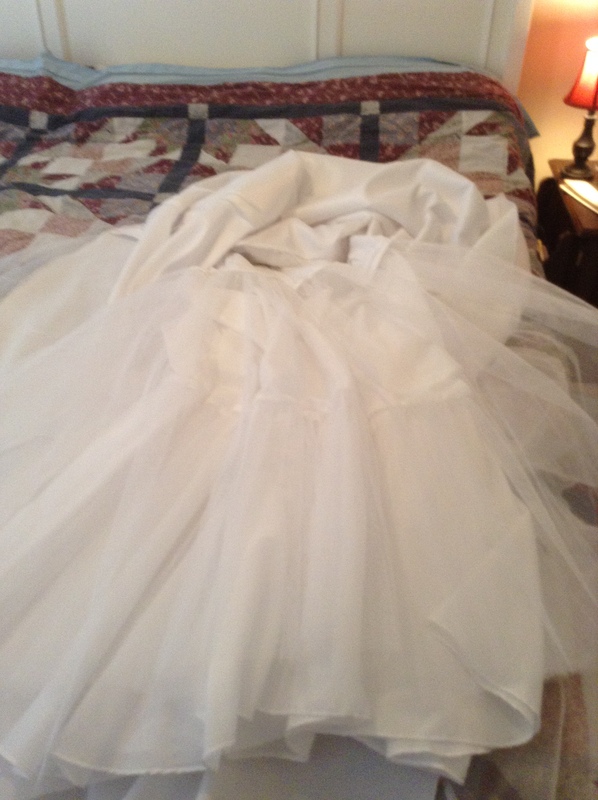 So, now I have to start thinking about a ball gown! I checked out etsy but then I also thought that I could do my own if I kept it simple. I have some sewing skills. My biggest issue is actually going in straight line, lol. 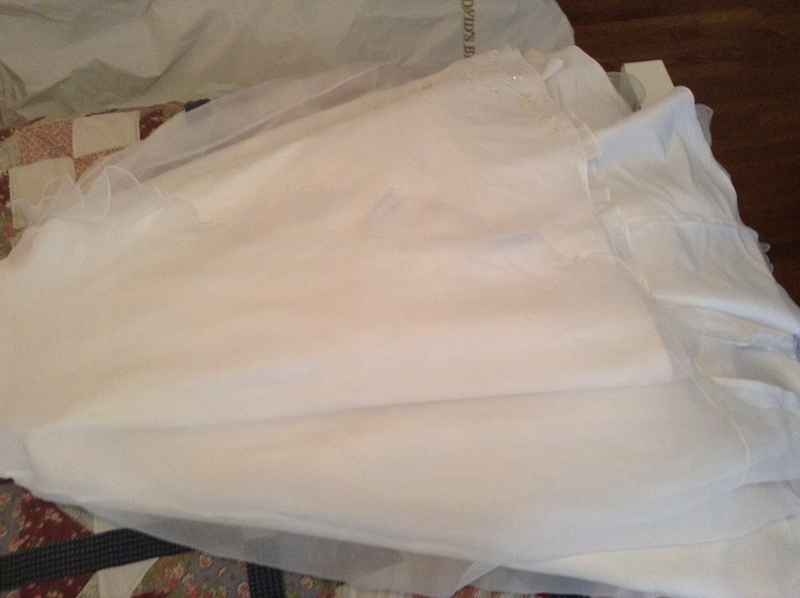 This morning I was checking emails and lounging on my bed and glanced in my closet and saw the bag of my wedding dress (usually in storage but we’ve recently moved). I’ve had it just sitting in a bag for 10 years! Now I’m thinking about all those yards of free white satin I have just sitting there. 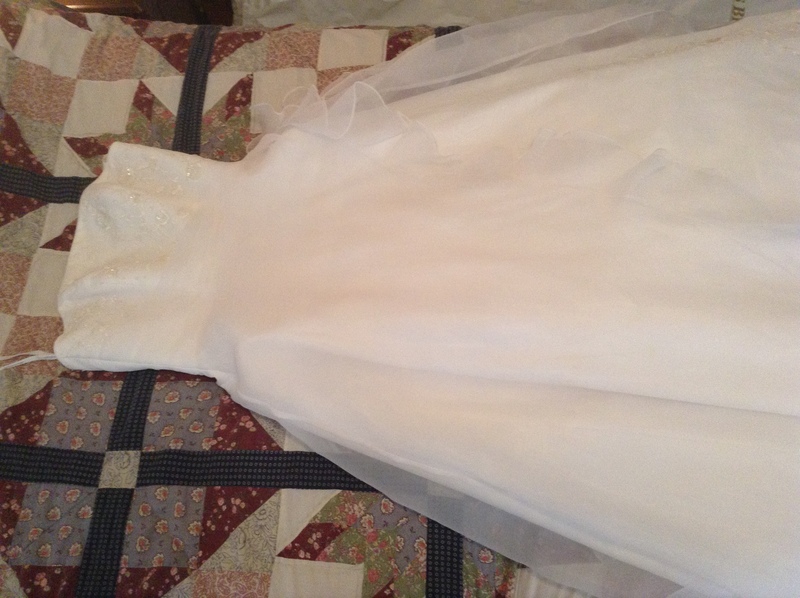 So, I’m considering ripping off the organza, sequins and the netting underneath, hemming it and adding sleeves. I will need to check the width. 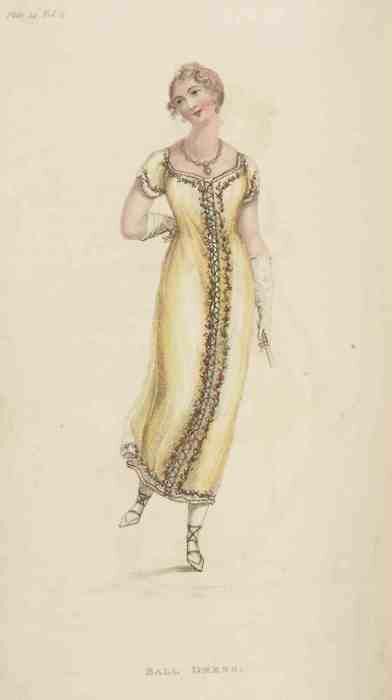 Some Regency ball gowns were rather wide and some were not. This is just tacked on! 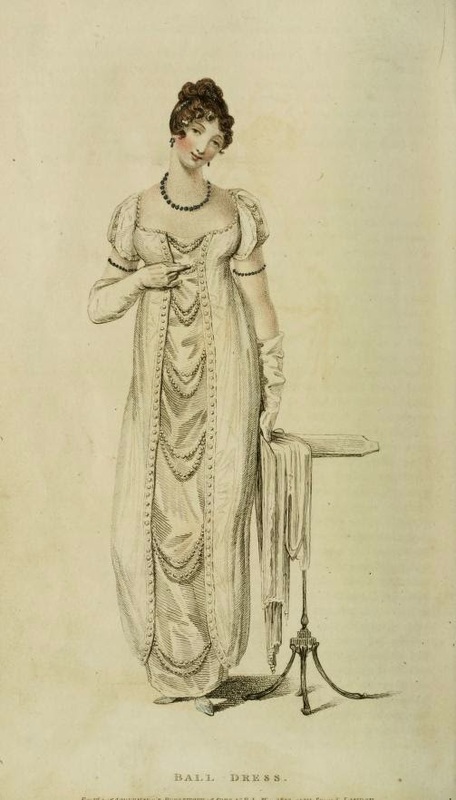 First, forget what you think you know about Regency gowns because they were not all the same or uniform. 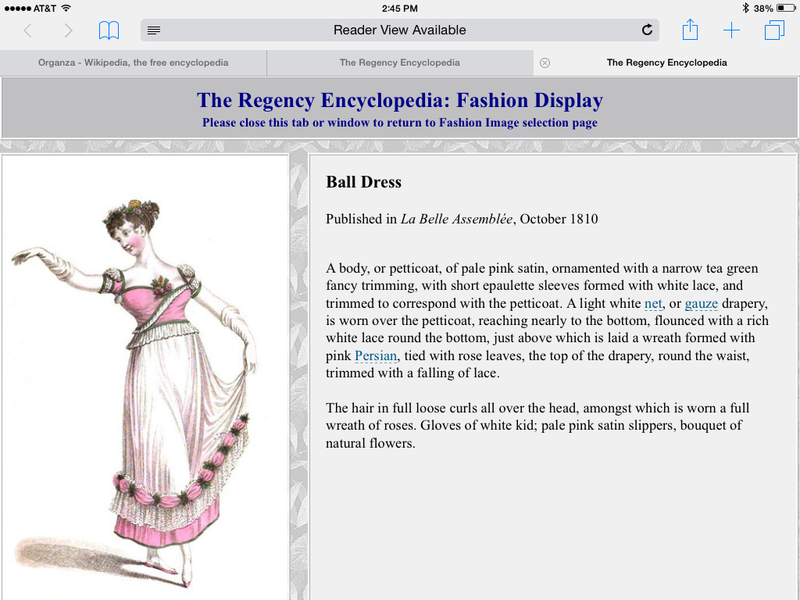 For my searches I relied on the Regency Encyclopedia and only searched for ball gowns, although a few “full dress” options showed up as well. 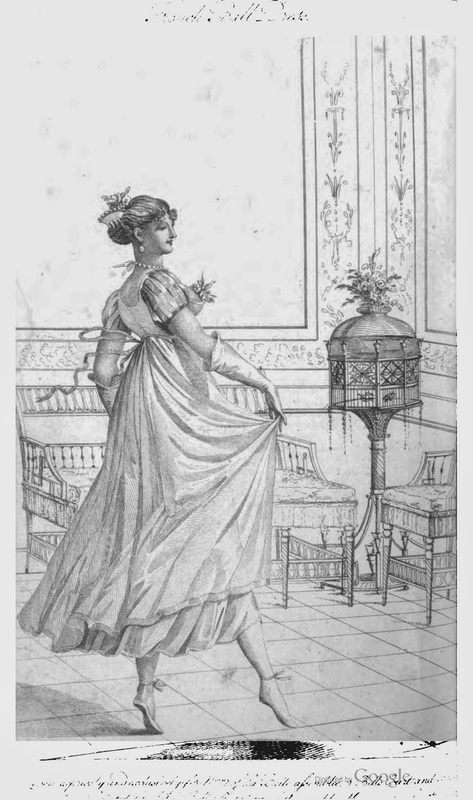 Ball gowns were definitely shorter, for obvious reason. 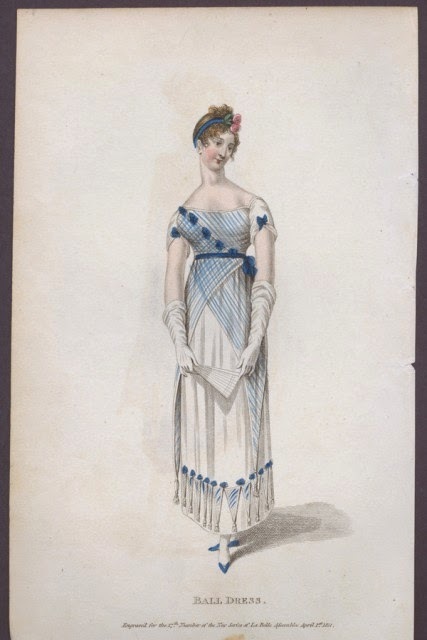 That’s not to say you couldn’t wear a full dress gown with a train and dance. 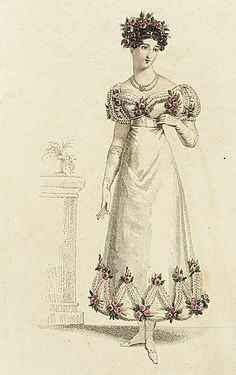 You could, but someone like Kitty and Lydia probably would opt for the shorter ball gown option instead of pinning it up. They did, after all, only know to enjoy a ball by having partners for each dance. Since I’m not so experienced with trains, I think I’d rather not have one as well. I also made sure to only compare the English plates as the French costumes can be very, very different since there wasn’t a lot of swapping of ideas due to the Napoleonic Wars. 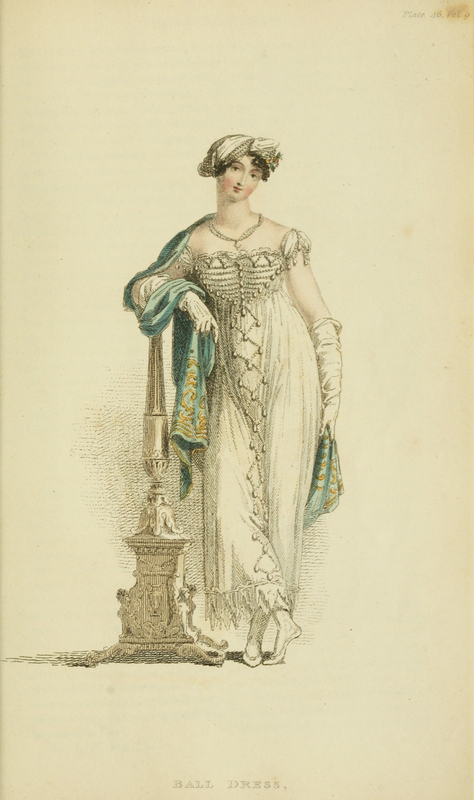 Now, the Empire gowns that you think are Regency is not the only option. That’s actually called a “round robe” it has a seam around the “waist” which varied greatly during the entire era, as you will see below. In general they were above the natural line until the mid 1820s but you can see how they fluctuated during the era. Many gowns had no waistline at all. You can see on the plates that I do think they hug the curves a bit, it’s not to be a total column, but I suspect that is friendlier to those without a lot of curves. Again you can see here how the waistlines can differ even within months of each other, so I rather think both were acceptable all the time. Another no waist dress, with less figure enhancing trim. Some were narrow, and some were wider. 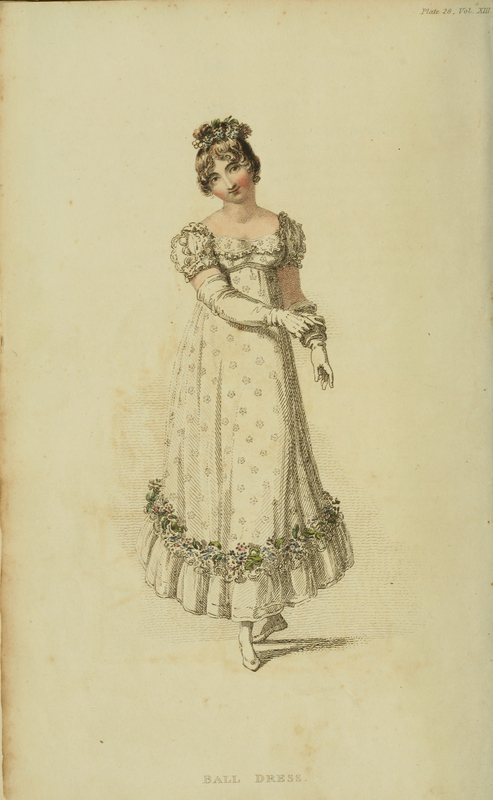 September 1807- gracious look how high above the ankles that dress is! See the extra flounce? 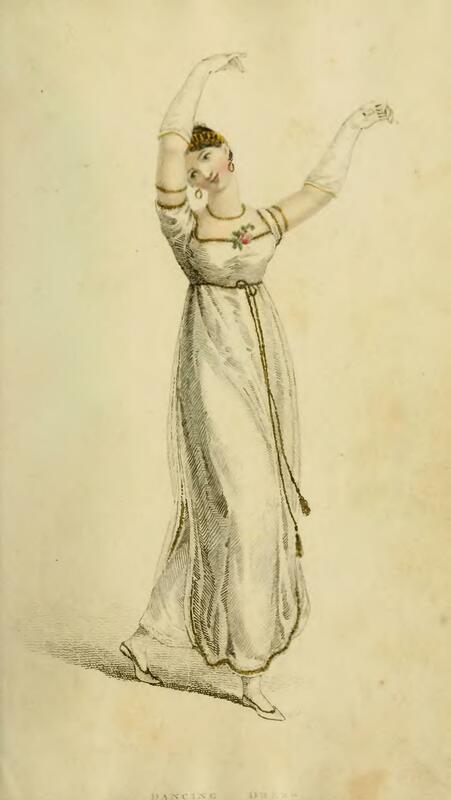 May 1811. 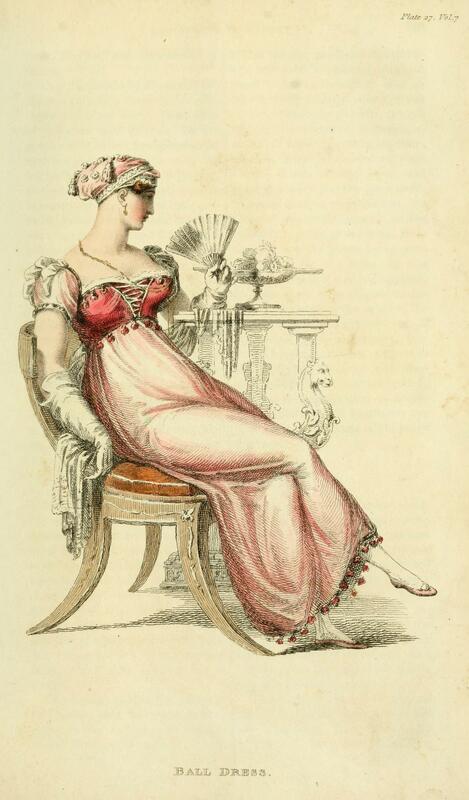 *Note, this one specifically says it was a French design, which I think explains the low cut back. Sorry I had to do a screen shot of this one. This is English but still wider than some other styles we’ve seen. 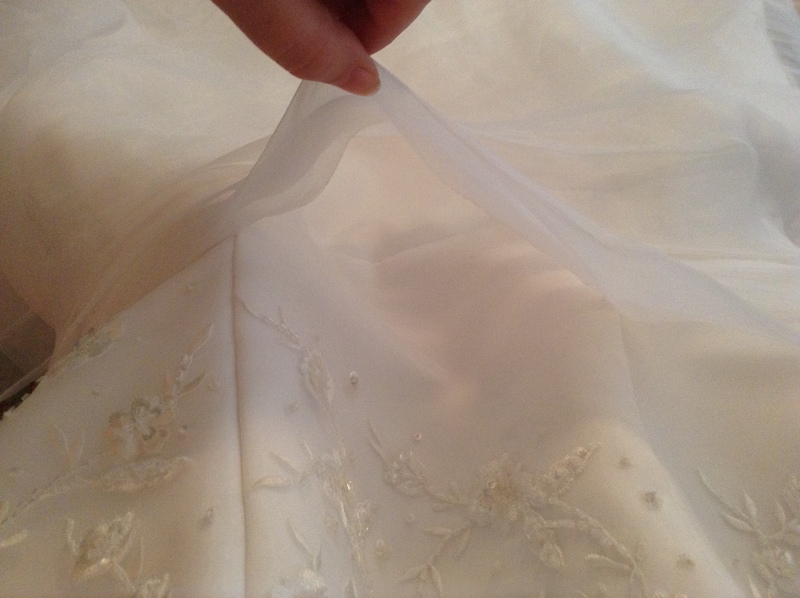 My wedding dress was strapless (I wore a cover up) so attaching sleeves is going to be something to think about, versus just deconstructing the whole thing and using the fabric with a pattern. 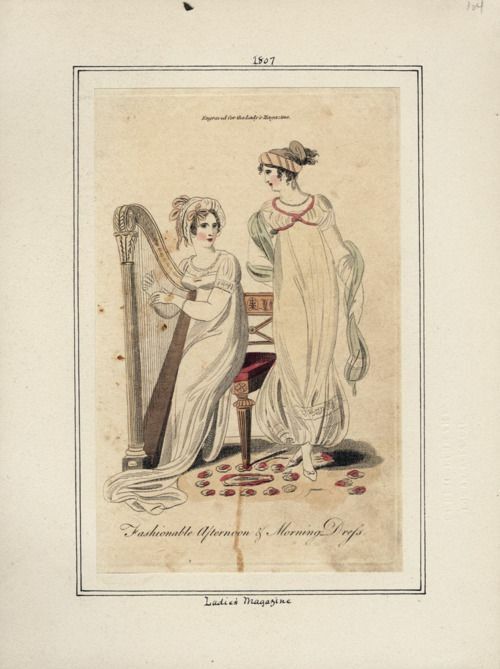 But there are some interesting options in the fashion plates. In the end I think I essentially want this kind of dress. I do have curves so I’ll likely add a cord or a trim for my bust line. It may or may not have an overlay. It does have some pretty embroidery on the top of the bodice. And sleeves may look like this. ← Green Card giveaway winner announced!